As summertime desserts go, the combination of crunchy tart crust, thick cream filling, and fresh fruit is pretty much unbeatable. Traditional recipes call for one of the three standard French short crusts (pâte sucrée, pâte brisée, pâte sablée) filled with rich pastry cream, but, really, pick any crust-custard combo that makes you happy. Dense almond crust with cream-cheese filling? Check. Flaky pie crust with mascarpone filling? No prob. This version combines an eggy pastry cream (reminiscent of Bird's Custard) inspired by Dorie Greenspan with Alice Medrich's wonderfully easy and delicious tart crust. Serve the tart simply, as pictured, with the freshest of soft summer fruits, or gloss it up, pastry-shop style, by brushing melted apricot jelly across the arranged fruit. 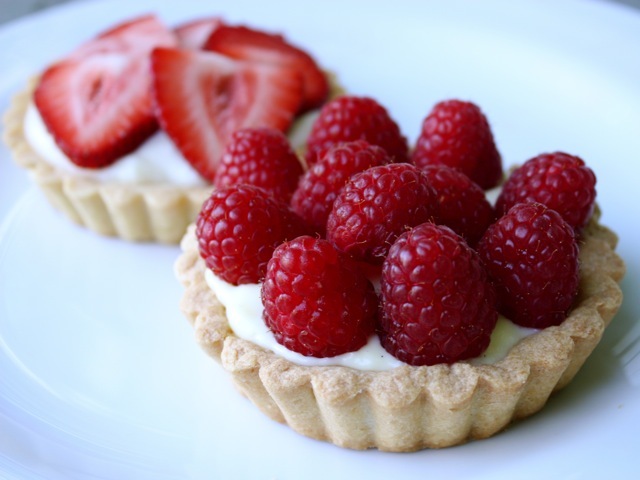 Keep in mind that the recipe makes one large tart; you can easily divide the recipe into two or more smaller tarts. You can also make the tart crust and pastry cream ahead of time, chill them, and assemble the final tart when you're ready to serve it. Make the crust: Place a rack in the lower third of the oven. Preheat the oven to 350 degrees. In a medium bowl, combine the melted butter with the sugar, vanilla, and salt. Add the flour and mix just until blended. Set aside for a few minutes to firm up. Bake until the crust is a deep golden brown, about 20 to 25 minutes. Cool the crust completely before filling with the pastry cream. Make the cream: Put the milk and cream into a small saucepan. Cook, whisking lightly, over medium heat until just scalded. Whisk the egg yolks, sugar, and cornstarch together in a medium saucepan until evenly incorporated. Gradually add the hot milk in a slow stream, whisking constantly, until the milk is evenly incorporated. Cook the mixture over medium-low heat, whisking steadily, until it starts to thicken. Add the butter, a little bit at a time, whisking it in until dissolved. When the cream is smooth and glossy from the butter, whisk in the vanilla. Scrape the cream into a bowl and chill — either slowly, by placing the bowl in the fridge (with plastic wrap over the surface of the cream) or more quickly, by propping the bowl in a larger bowl of cold water. Assemble the tart: When the crust is cool and the cream has chilled, remove the crust from the fluted pan (for a prettier presentation) and spread the cream across the crust. Arrange the fruit however you like across the top of the cream. Serve the fruit tart as is, or make a glaze by mixing the jelly or jam with 1 teaspoon water in a small saucepan and warming it gently. If you're using jelly, use a pastry brush to lightly spread the glaze over the fruit; if you're using jam, strain the warmed jam through a sieve, then spread the strained glaze over the fruit. For a more luxurious pastry cream, replace the vanilla extract with 1/2 vanilla bean. Split the bean lengthwise and scrape the seeds into the milk and cream before scalding. Other soft fruits that work well as tart toppings include sliced kiwis and supremed oranges.